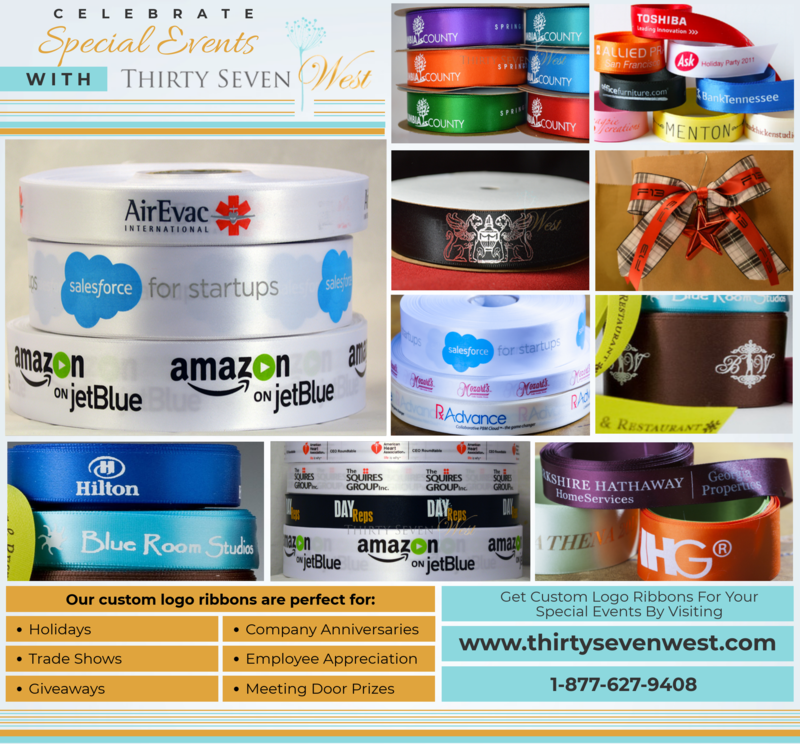 Corporate Ribbon with Logo Archives - ThirtySevenWest ThirtySevenWest - Creative ideas about personalized custom ribbons, woven tags and labels, personalized gifts and more!!! Research shows that 89% of recipients of promotional products remember the name of the companies. With a high awareness rate, it is imperative for businesses, especially new ones, to invest in branding options to create brand visibility and leave a lasting impact on clients. 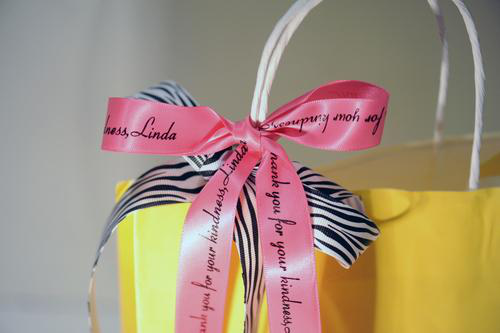 Perhaps, one of the best ways to do that is by using custom ribbons for corporate gifts, giveaways, and merchandise. Companies often spend thousands of dollars in marketing efforts to promote their business and products. While some focus on exclusivity, superior quality and price, others focus on packaging and presentation. A product that has all those elements is most likely to perform the best and create a professional image of the brand. Business owners are quickly understanding the importance of packaging to make corporate gifts stand out. Merchandise products are a great and effective way to entice customers and drive interest. Here’s why you should be packaging your merchandise products in custom ribbons, with your brand logo and slogan, for creating stronger brand awareness and enhancing customer loyalty. Custom ribbons are a relatively low-cost marketing tool that is effective in not only enhancing the look and appeal of merchandise products, but also promoting a brand’s image successfully and instantly. When somebody sees your product, they instantly see your logo and your mission statement; when they use the product, your company’s name sticks with them. The ribbons manufactured by Thirty Seven West can be customized endlessly. Whether you want your company logo, name, or slogan to be beautifully printed on the ribbon, you can avail a range of customization options to meet your branding needs. From designs to ribbon size, to the materials and colors, business owners have a lot of room for creativity. It’s true—first impression is the last impression. A beautifully packaged product is the first thing a user sees before they unpack it, but by the time they do, they’ve already been impressed by what’s on the outside. Presentation is a crucial element in today’s competitive marketplace. With so many products competing for customer attention and recognition, it is important to add something elegant to your product that makes it even more special and noticeable—and Thirty Seven West’s high-quality custom ribbons do just that. Thirty Seven West’s complete collection of custom products and ribbons is the perfect solution for engaging your customers and making your merchandise products stand out from the competition. Multi Color Logo Ribbon, Logo Ribbon, Custom Logo Ribbon, Printed Ribbon. Consumers are constantly bombarded with marketing messages everywhere they turn. From social media ads to emails, to even text advertising, getting your brand to stand out from the crowd can be easier said than done. Your customers want to feel connected to your brand and findings ways to provide unique, thought-out and personalized interactions is key. In fact, McKinsey & Company recently found that personalization reduces acquisition costs as much as 50%, and can lift revenues by 15% (1). So, by getting personal with your customers you’re able to convey that you care and value their business while also improving your marketing ROI. What are the best ways to personalize your brand? Using names as often as possible. If you’re making a customer service call, following up on a past purchase, or simply reaching out to share new promotions, use your customers’ names and in all interactions. Consumers are savvy enough to know when they are receiving a blanketed marketing message versus one that may be tailored to their past history with your company and/or specifically addressing their needs. Make the most of holidays and big events. Is Christmas approaching, want to say “Happy New Year” with a flare, or simply sending along a “Congratulations”, capitalizing on holidays and significant events in your customers’ lives can be an effective way to make a connection and keep your brand relevant to them. And, receiving a special email or printed card can help you distinguish your brand as one that cares for and appreciates your customers. Go for unique gift ideas. Whether you sponsor monthly giveaways, host corporate events, or send your customers “thank you” gifts, finding ways to customize them can be critical in setting your brand apart. Leading companies like Amazon, Salesforce, and Lexus are leveraging custom logo ribbons to give their gifts a refined, yet personalized look and feel. To make your marketing the most effective, it is time to shift from a one-size-fits-all approach and go for customization to truly connect with your target audience. 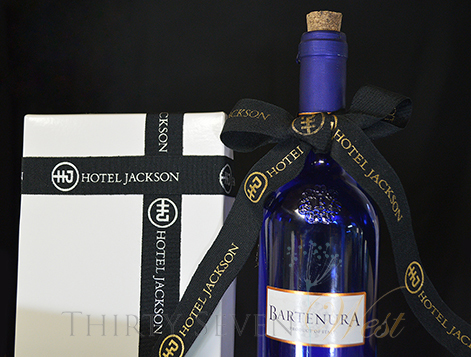 If you’re considering custom gifts for your next corporate event, or think your marketing swag could use a much-needed upgrade, browse our full selection of personalized gifts and ribbons at ThirtySevenWest.com. As a marketing specialist, one of the most innovative ways you can promote your brand is to invest in small but powerful strategies that help you achieve multiple goals. If you’ve ever used logo ribbons as festive décor, you already know their value in terms of cost and creativity. Custom ribbons are a classic way to add intriguing appeal to any event. They’re tried-and-tested marketing tools that boosts brand recall, engages audiences, add aesthetic and sentimental value to a product, and make a lasting impression on your audience. Traditional satin ribbon is made from silk, hence its association with “luxury”. However, modern satin ribbons, usually made from cost-effective synthetic materials like polyester and rayon, are able to deliver a similar glossy sheen that you often find in silk ribbons. The light-reflective texture of satin gives the ribbon that unique “shine” to make your logo pop. This is a particularly attractive option for formal occasions, corporate awards or specialty items. Matte textured ribbons are elegant, understated and excellent at holding their shape in a bow. Similar in texture to a cotton ribbon, matte ribbons pair seamlessly with metallic prints and looks particularly stunning with a gold and silver logo design. Simply print your logo on it and add some sparkle to a humdrum package, giveaway or gift bag—and voila! dest grosgrain ribbon with a unique ribbed appearance. It is also a firmer and more durable fabric that’s excellent at holding its shape. 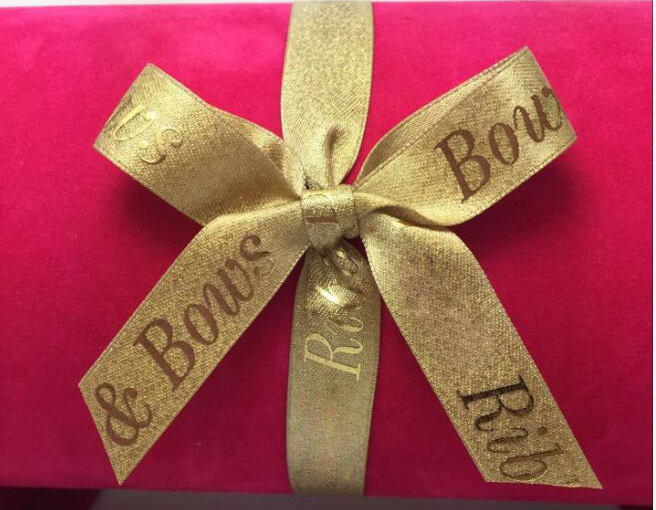 Organza ribbons are particularly popular in the culinary world, but also used in artsy-craftsy businesses to add some creativity to boxing and packaging. 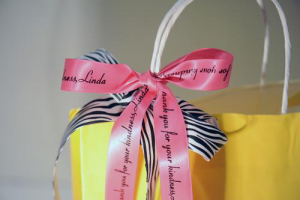 If you’re ordering a big cake or arranging favor bags for your corporate event, invest in some colorful organza logo ribbon to wrap up the goodies and make a statement. If you’re looking for versatility, woven ribbons are an excellent choice! You can use them as embellishment on clothing, bags, or to wrap up T-shirts, hat combos—you name it! Generally, we recommend one color logo on one color background since the back is a reverse of the front. With a choice of up to 8 colors, woven ribbons are a favorite at luxury destination gift shops. If you run a golf resort, country club, or PGA course, this could be your ideal choice! For eco-friendly companies, cotton ribbons are a perfect way to get creative while making an environmental statement. Choose between bleached white and a natural color and make your logo stand out without going overboard. Check out our growing collection of custom ribbons with your logo and call us at 1-877-627-9408 for a free sample! Celebrate Special Events with Thirty Seven West! Posted in Logo Ribbon | Comments Off on Celebrate Special Events with Thirty Seven West!